Social media platforms are constantly changing. I hope this article will provide you with an introduction, catch-up or refresher on social media marketing. I pulled together some social marketing tips for a presentation to WordPress website developers and designers at WordCamp Los Angeles (WCLAX) on September 27th. Several attendees asked for Twitter tips so that is my primary focus here. I decided to use the format I have used in this article instead of just sharing a set of slides, so that I could add some verbiage and give you links to articles I have written that further explain some of my points. The WordPress.TV video of my presentation is at the end of this article and at this link. I strongly recommend WordPress for websites. The audience I was speaking to is very talented in building them. All elements of this article are copyright Linda Sherman. Please include a link back to this article if you share it online. The images are watermarked, so you are welcome to share any of them so long as you leave the watermarks intact. There are some common errors that can be easily remedied. 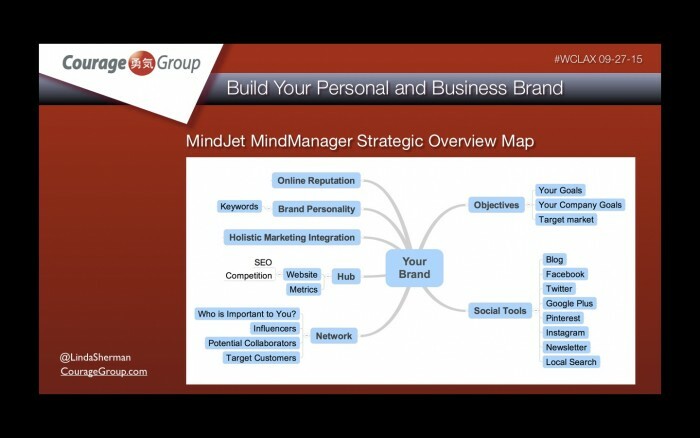 We use MindJet MindManager mind maps with clients for everything from brain storming for 5 year business plans to website plans. If you see me at a conference, you will notice I am taking notes with maps. Maps are much easier for the right brain to absorb. There is more than one mapping software out there. We like this one. It is very easy to use with drop and drag and sections can be highlighted with color. Maps can be saved as PDF’s and shared with clients with live permalinks in the entries. The cobbler’s children have no shoes applies to many website developers and designers. We are so busy with clients that we put ourselves last. Take the time to review your own website. I am recently very impressed with the social share tools that Social Warfare has. You have many choices to customize the share buttons to look attractive with your website, along with tools such as in-content tweet suggestions that help you build engagement back to your site. 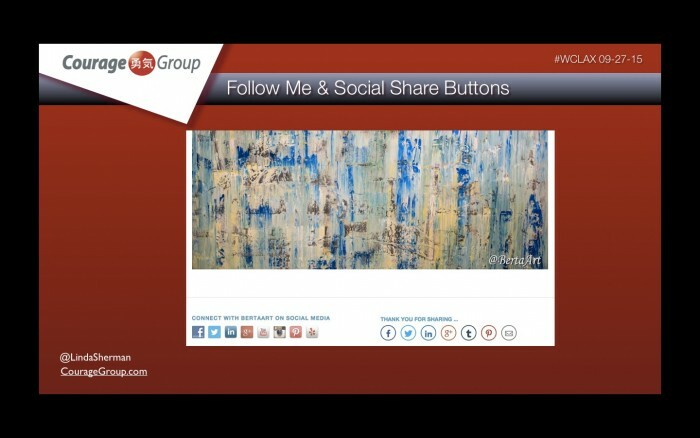 These are Simple Share Buttons on Clara Berta’s BertaArt.com site. Keep your social media bio’s up to date. 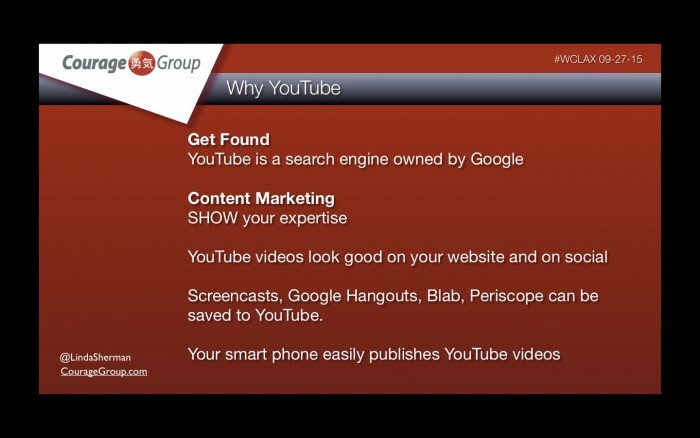 Include links to your website and other social media platforms where you can. For instance, your Facebook personal Timeline About page includes a place to add these links. It’s a place your Facebook friends might look for your Twitter handle, Facebook Brand Page or website. You have room for 6. Use them. 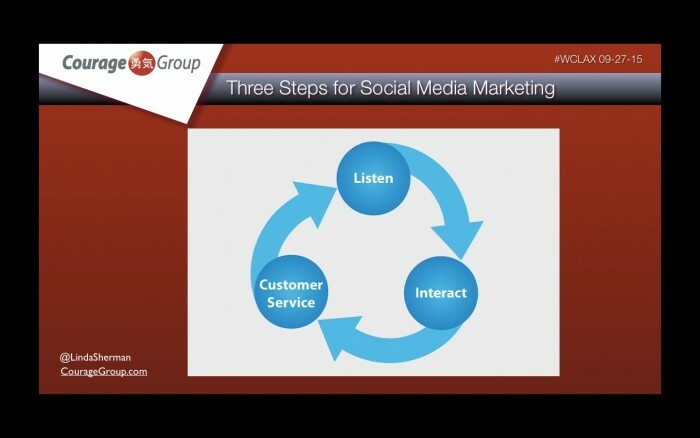 If you are not going to actively listen and respond, do not set up a Facebook Brand Page. 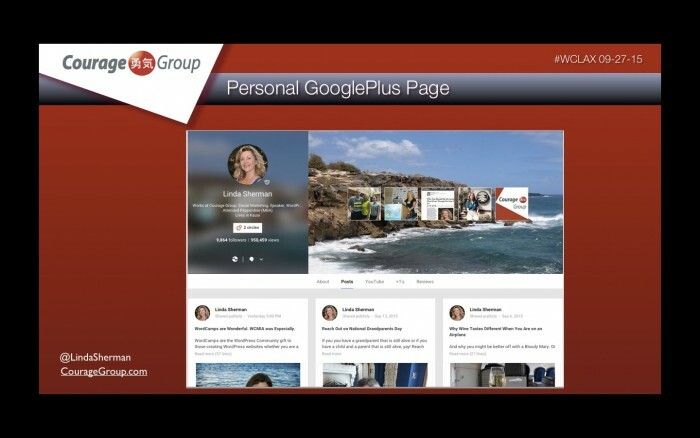 GooglePlus Brand Pages can interact with GooglePlus Personal Pages, wherever they like. Facebook Pages are quite limited in their opportunities for interaction with Facebook Personal profiles. 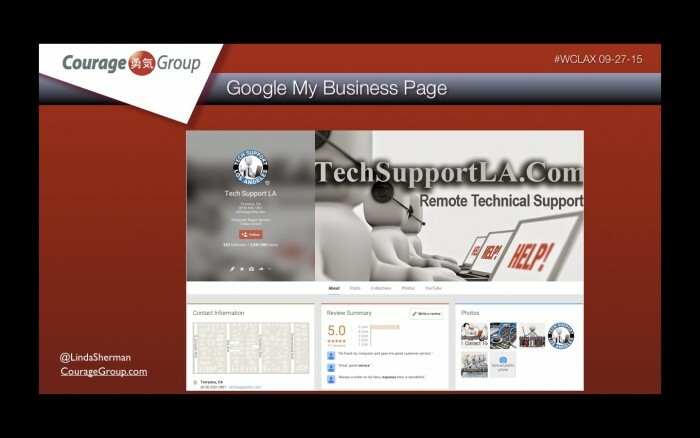 If your business is “brick and mortar” retail or you can give out your office address, you should have a “Google My Business” Page. These pages come up early in local search. 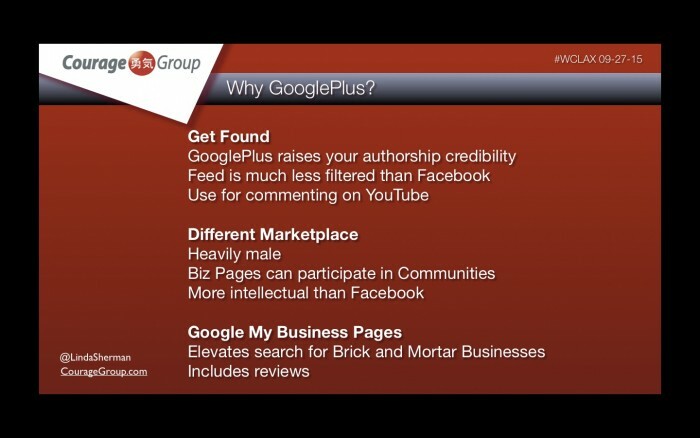 If you have had a “Google Places” account or GooglePlus Local account, it is now a Google My Business account. Be sure to take care of it. If you want reviews that will be seen in search, send people to your About page here. 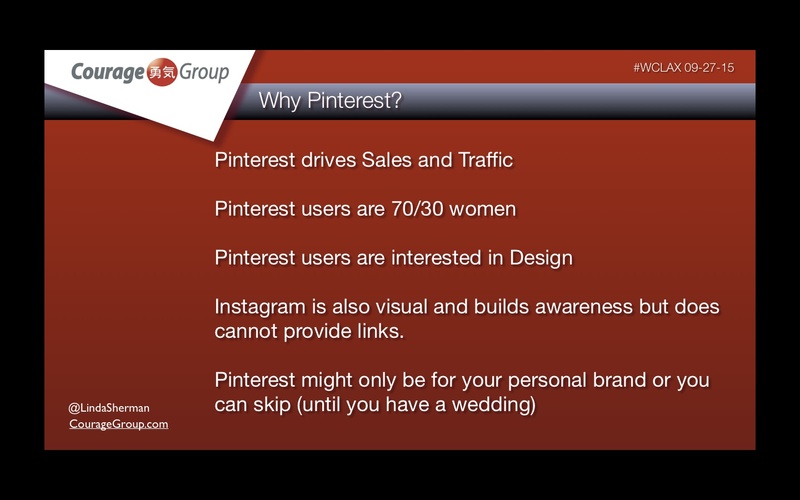 This “Why Pinterest” slide was written for web developers and designers; if your business has to do with food, travel, fashion, weddings, architecture, interior design, photography, cars, sustainability, pets and other topics that touch on the dreams and plans of Pinterest users, you should invest time building your Pinterest boards. I recommend that you watermark your images everywhere. Many people don’t understand the legal usage of original images. Here is a very complete article on proper photo attribution and why you should watermark. This article explains why and how to use the iWatermark+ mobile app. Manage your Twitter connections by putting them in lists. 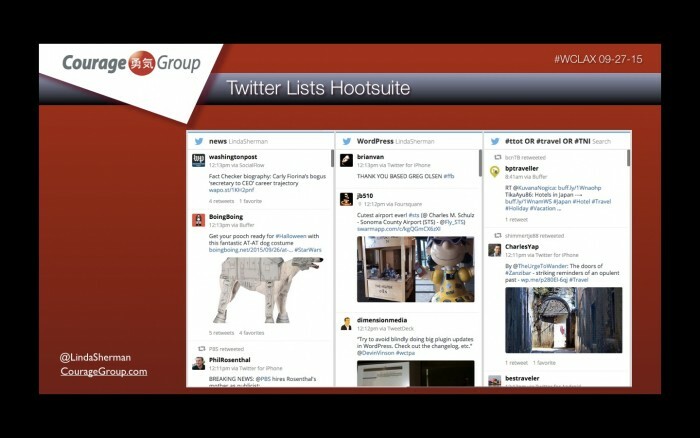 Access your lists through Hootsuite. This platform is free unless you need to manage teams. You can have public and private lists. You can see when someone adds you to a public list in your Twitter notifications. 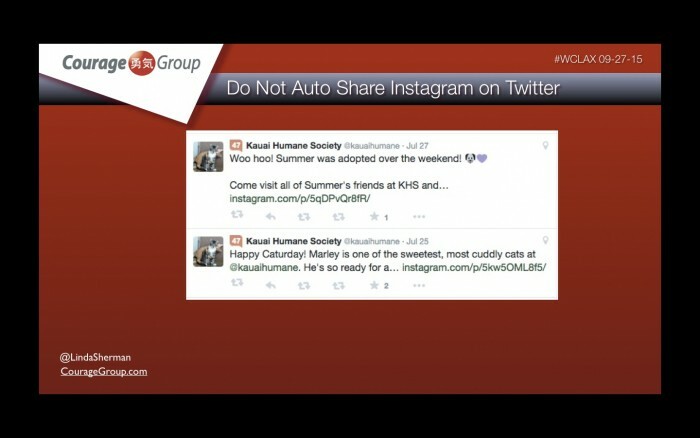 Don’t auto post across social platforms – except from Instagram to Facebook, and Vine to Twitter. 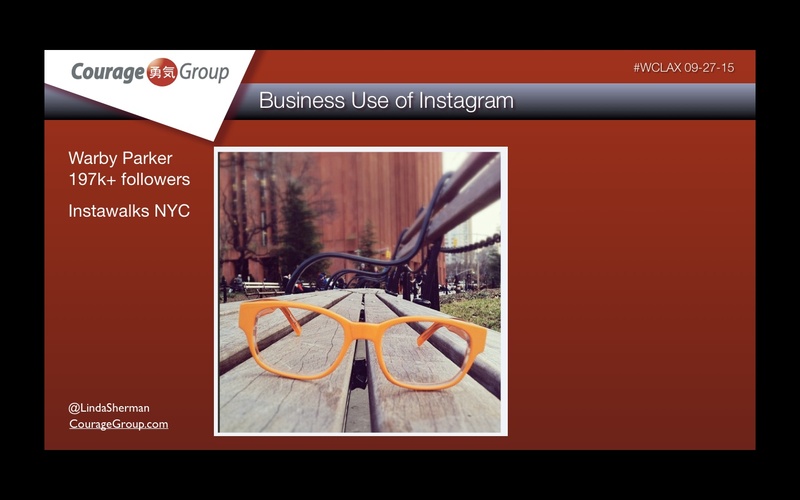 If you autopost from Instagram to Twitter, your Instagram image won’t show up and few people will engage with such posts. Take a moment to post your image directly to Twitter.com. Photos look best when loaded directly to Twitter.com. When you autopost from Instagram or Facebook to Twitter, your image does not show up at all. 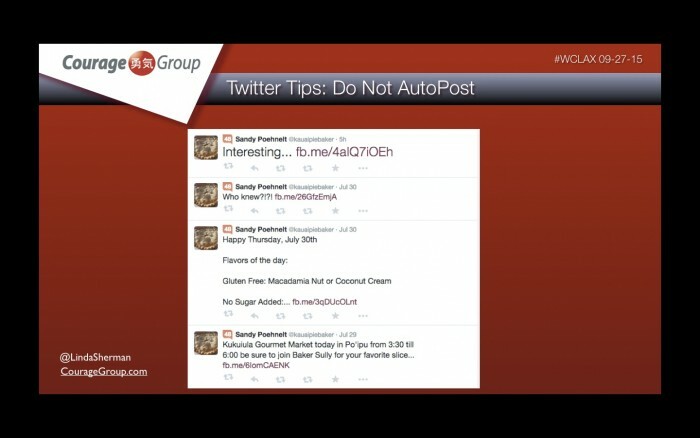 We know that you are auto posting because you don’t want to take the time to post on Twitter but at the same time, you want content there. Unfortunately, you are very obviously not present and your auto posts don’t inspire engagement. Instead, post less often but post directly. As for @KauaiPieBaker, her pies will totally inspire you – they are the best! You can buy them on Kauai or online at RightSlice.com. The only exception for auto posting Instagram is to Facebook because Instagram OWNS Facebook and makes Instagram images show up very nicely. They also put them through the newsfeed. For Twitter, the auto posting exception is Vine, because Twitter OWNS Vine! Vine videos show up beautifully on Twitter. Twitter initiated a method to hide conversational “chatter” from the front of your Twitter profile that is not of substantive interest to your followers. If you begin a tweet with an @name mention, your tweet goes to “tweets and replies” which people seldom click on your profile. These tweets are only shown to the person/brand you mentioned, the people who follow both you and that person/brand and anyone searching for a hashtag you used in your tweet. It is easy to accidentally “hide” a tweet this way because when you click “reply”, Twitter automatically puts the @name at the beginning of the tweet. You can put a dot before the @ or add words in order to make it “public” instead of partially hidden. @MarshaCollier is overall one of the best people to learn how to use Twitter from by watching what she does. Click on “Tweets and Replies” on Marsha’s Twitter profile and see how she takes advantage of this “replies” feature to maintain relationships with her followers while reserving value content for her “Tweets” that go through the newsfeed to all followers and display on the front of her Twitter account. 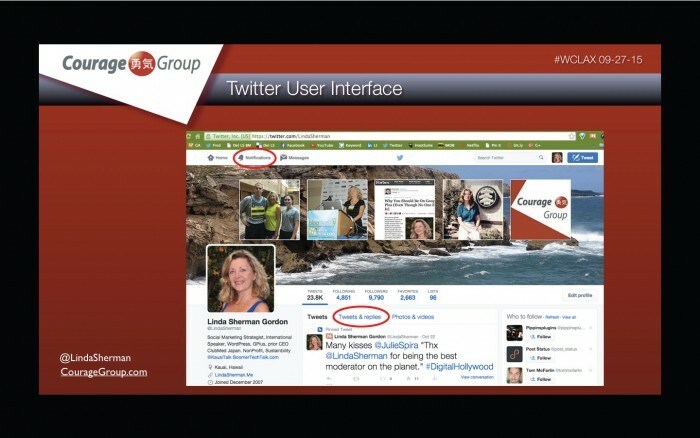 You can find mentions of yourself or your brand/organization at the “notifications” tab on Twitter.com. You can search for Twitter handles by name on Twitter here. I have this link bookmarked on my Chrome browser bookmark bar. To build relationships with bloggers and other writers, tweet something from what they wrote with an @name mention. If you are using their social share button for Twitter and their share button only adds their @name to the title of their article in the tweet it creates for you, add “by” before it. Better yet, take a moment and craft a unique tweet that shows you read the article, of course including the author’s Twitter handle with “by”. 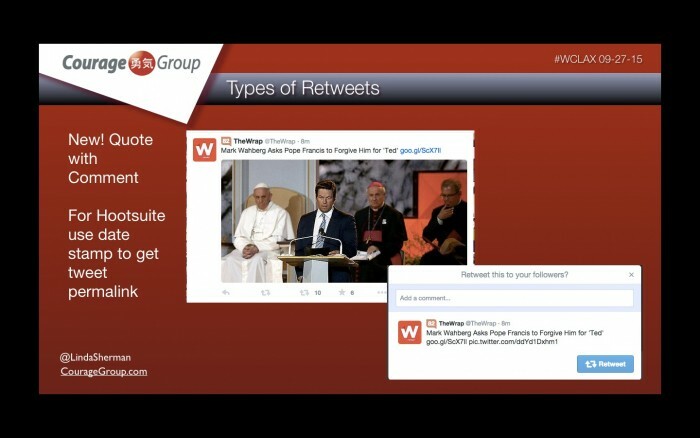 Look at this image to see where these elements: Tweets, Tweets and Replies, Notifications are on your Twitter account. It will also make you feel better because someone will see your tweet. It is easy to feel invisible on Twitter, especially when you are getting started. Here are my tips on how to participate in Twitter chat as well as how to find chats about topics of particular interest to you. 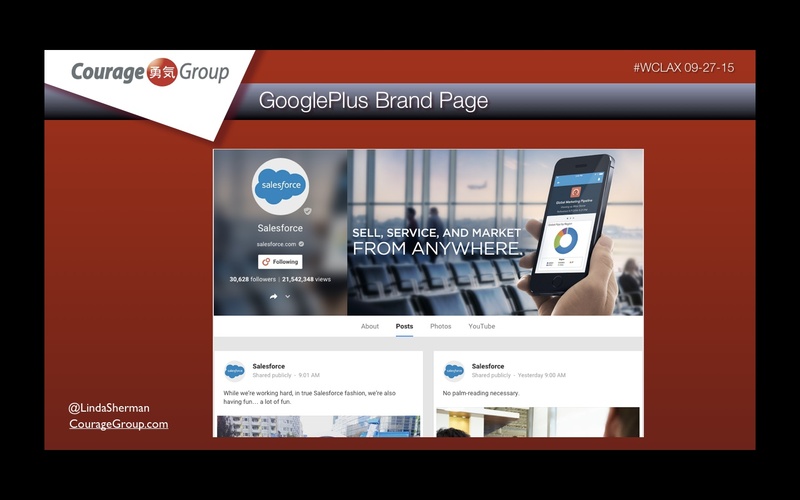 #CustServ is hosted by @MarshaCollier and her team, Tuesdays 6pm pst. #BlogChat is hosted by @MackCollier, Sundays 6pm pst. Both chats are very thoughtfully managed. You will be pleased with who you meet there. It is currently easiest to use this new feature from Twitter.com. Click on the “retweet” icon and it will open up as shown below to allow you to add a comment. To retweet with a comment from Hootsuite, get the permalink by clicking on the date stamp of the tweet you are quoting, and add it to the end of your tweet. You can get permalinks from date stamps for posts on all social sites except LinkedIN. The person you are retweeting will be notified even if you don’t @name mention them in your comment. 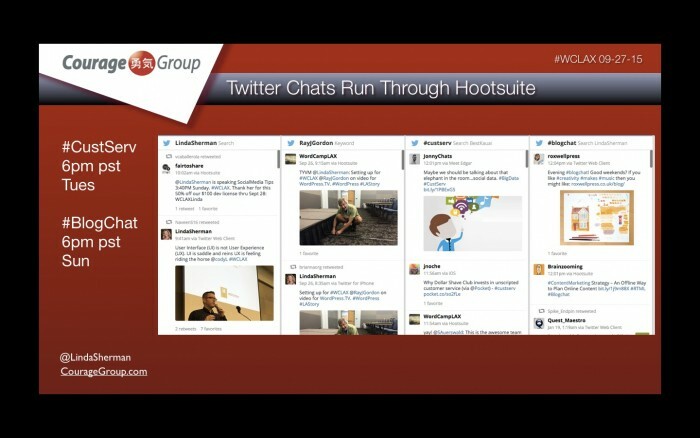 However, if you are participating in a Twitter chat, be sure to use the hashtag for the chat so that you are included in the chat stream. Other ways of retweeting are to use “via” at the end of your tweet; RT, or click the retweet icon for a full retweet that shows up only as their icon not yours (if you don’t add a comment). Whatever controversy there may be about Klout, it is important to know that it is visible. 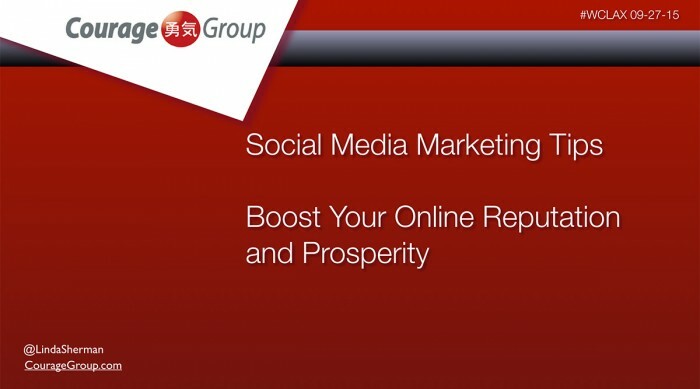 Large consumer companies use sophisticated enterprise level tools that include Klout scores. 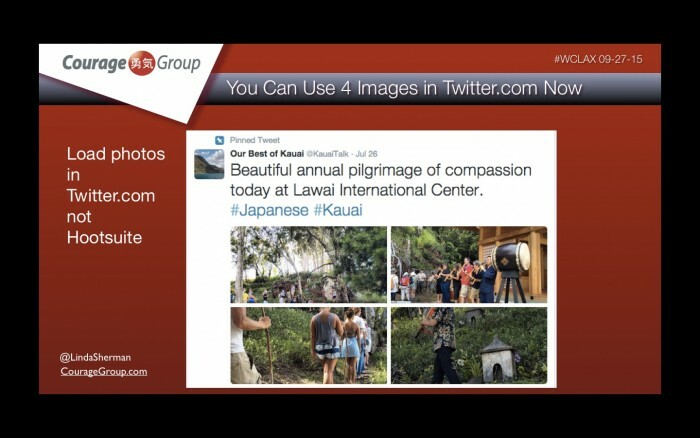 That little orange square that you see with a number on some of my slides is a Klout score being fed by the free Klout browser extension. It’s sad but true that in many cases, your Klout score may play a part in the level of customer service you get, your hotel room upgrade possibilities and more. If you are selling yourself to big brands, it increases your credibility. 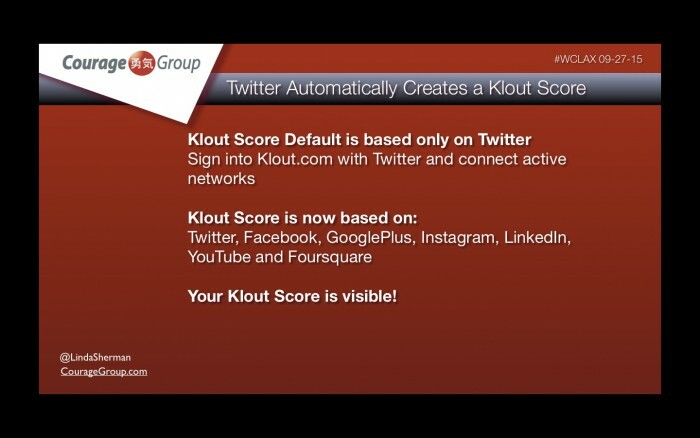 By default, your Klout score is created from your Twitter account. 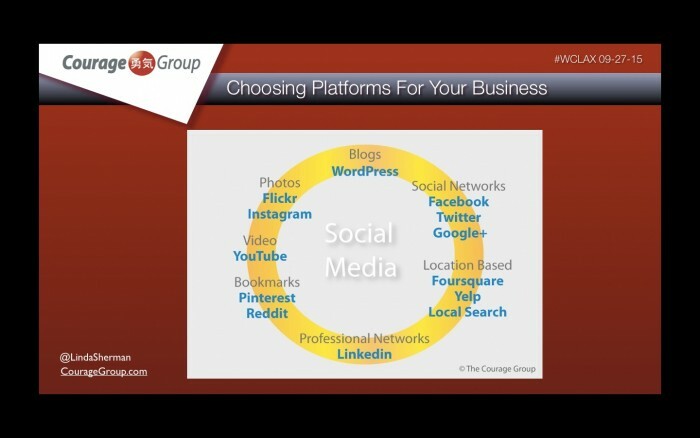 Here’s how to add other relevant social platforms. It will take you a maximum of 10 minutes to do this. Your score will go up after about three days. After that, don’t fret about it. But there is no reason to have an artificially low Klout score just because it is not connected. Following is the embedded WordPress.TV video of my presentation. This link will take you to the home of my WordPress.tv video where you can add a rating if you have a WordPress.com account. If you click on the video below you can increase it to full screen size.